Everyone’s favorite down on his luck, jack of all trades Gil Gunderson made a very surprise pre-Halloween visit to our virtual world’s bringing with him an original, min-event with Oktoberfest. I know if most of you are like me the “Oh it’s Halloween!” butterflies fluttered in my stomach when I first saw signs of an update. Not a very big or even unique content-filled update by any means but any chance to obtain fresh, new content is always a plus. The farther along we come the more excited I get to see just how deep into the archives the developers go to pull out new stuff for our Springfield’s. 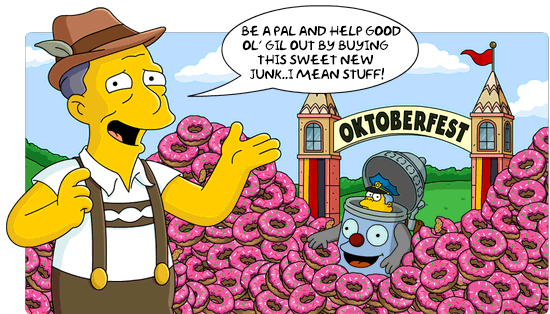 Seeing as how we’ve been lacking on a favored post series lately, I’m here to help you decide on whether to take ol’ Gil up on his offer of the Beer Stein Wiggum skin or let him go dumpster diving yet again for dinner and pass on it. Hopefully by the end of this I will have at least tried to best answer the burning question that comes with any premium purchase, Should I Buy…..Beer Stein Wiggum? Right this way and quickly! This item won’t be around much longer! The Oktoberfest mini-event brings with it 8 returning premium items in addition to the 2 brand spanking new items also both premium. 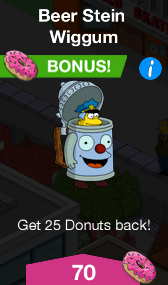 I will try to cover the returning items in a separate post but in my opinion, the Beer Stein Wiggum costume is the centerpiece of the update and the premium purchase I would consider the most. Therefore it is the item I am putting the most time towards at the moment. All 10 items are part of Gil’s offer and each offer comes in the form of the “donut rebate” system we first saw with the Black Friday/Cyber Monday Gil Deal 2014 during which previously released items were offered individually at different times for a set amount of donuts, some of which were then rebated upon purchase of each item. The catch is that even though you get donuts back with each purchase you must have enough donuts to meet the asking price. 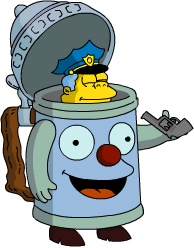 The hilarious undercover outfit for Chief Wiggum comes straight out of the show and is considered a canon item as is the majority of Tapped Out items which makes this game that much better than the never-ending, money wasting “quest for stuff” that other games use to rob your wallets. 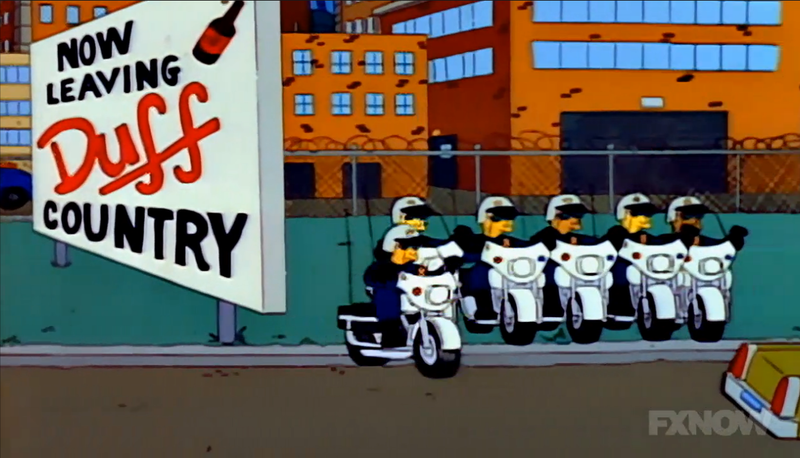 In the episode titled “Duffless” (Season 4, Episode 16), Chief Wiggum dons the Beer Stein outfit as he, Eddie and Lou stake out the Duff Brewery in the hopes of busting anyone who “over indulges” during the brewery tour. 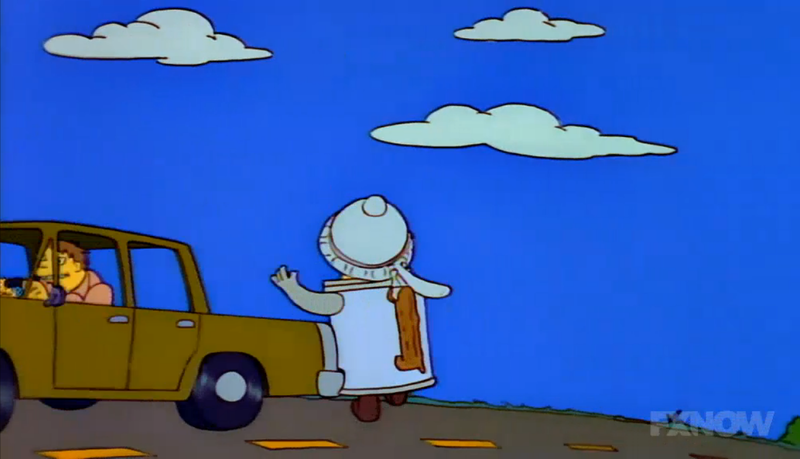 Coincidentally their stake out is happening on the exact day that Homer and Barney take the tour after Homer cleverly escapes the plant during work hours. In a very surprising twist of fate, it is Barney who gets more intoxicated during the tasting portion of the tour, NOT Homer. Outside of the brewery Homer pleads with Barney to let him drive. And by plead I mean Homer beats the living crap out of Barney in an attempt to knock him out after he refuses to hand Homer the keys. 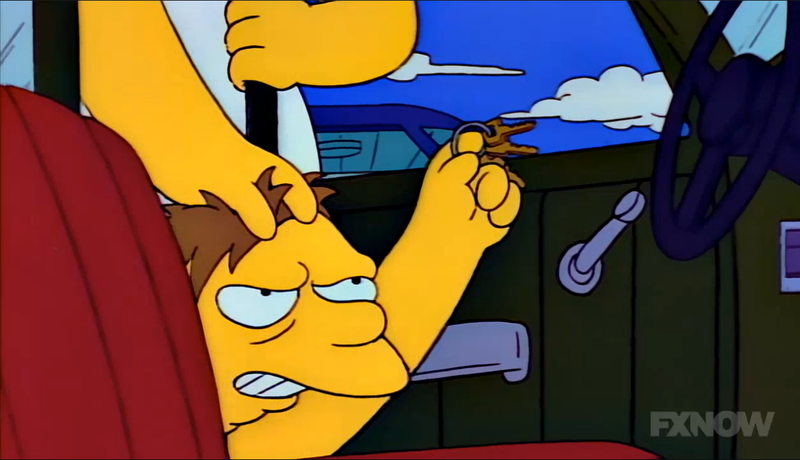 Although they both indulged in yummy, wonderful Duff, Homer was ironically the more sober driver and Barney finally caves. And as Homer peels out of the brewery parking lot he zooms right past a trap without even knowing. 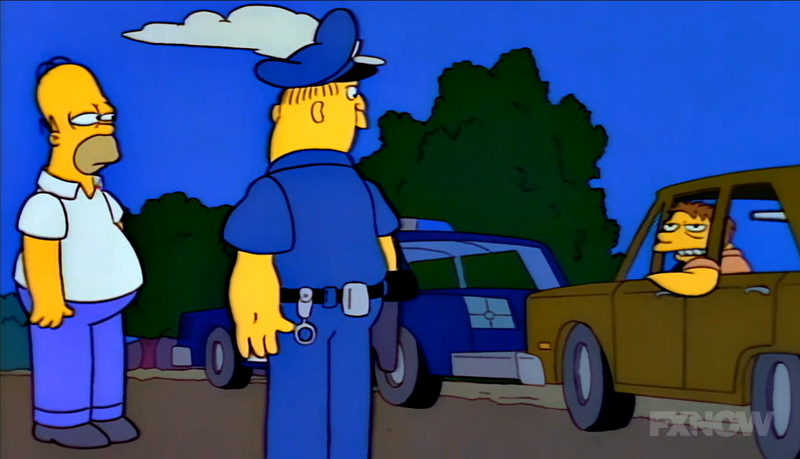 As soon as the car passes Wiggum radios to a gaggle of motorcycle cops, who are set up right around the corner, that a “couple of stewed prunes” are coming. 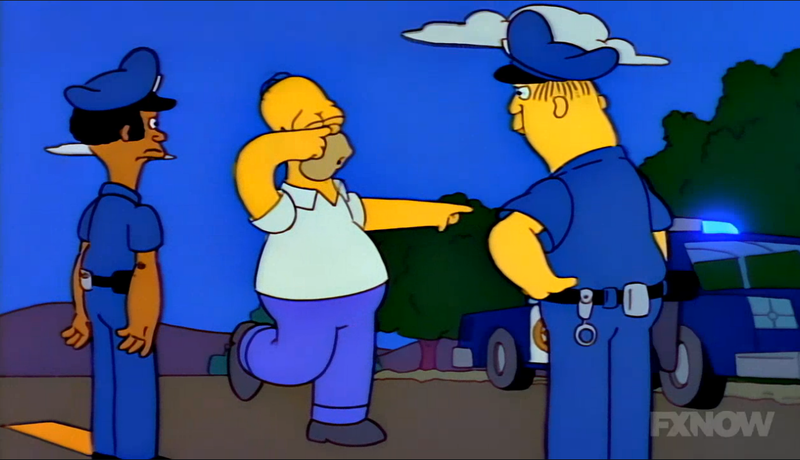 As you should have figured by now, the bike cops quickly pull the car over and Homer is subsequently given a Field Sobriety Test by Eddie and Lou. To everyone’s surprise, Homer PASSES the test with flying colors and appears as if he will beat a DWI rap. And quicker than you could open a Duff, Homer gets a Breathalyzer jammed into his lips, blows over the legal limit and ends up in cuffs, arrested for DWI. 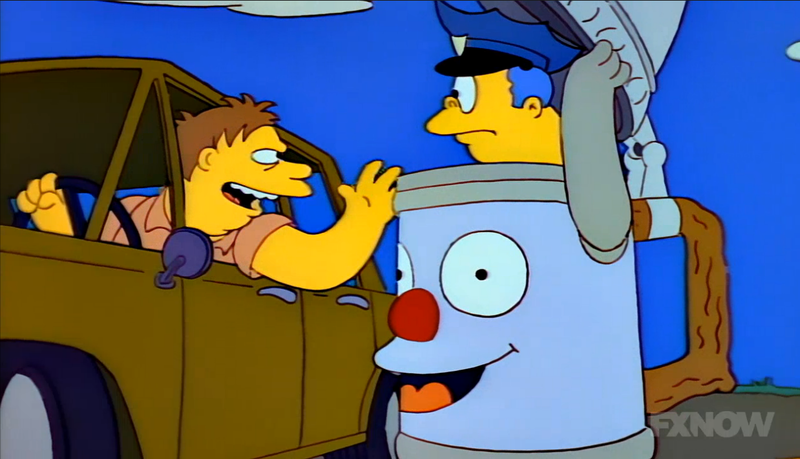 Wiggum, still donning the Beer Stein suit then asks Barney, who was significantly more trashed than Homer, if he can get the car home. Obviously, this was a terrible decision, even for Wiggum who constantly makes terrible decisions and Barney then proceeds to ram Wiggum as he reverses the car. Sending the Chief, costume and all, tumbling down a hill and into a field. 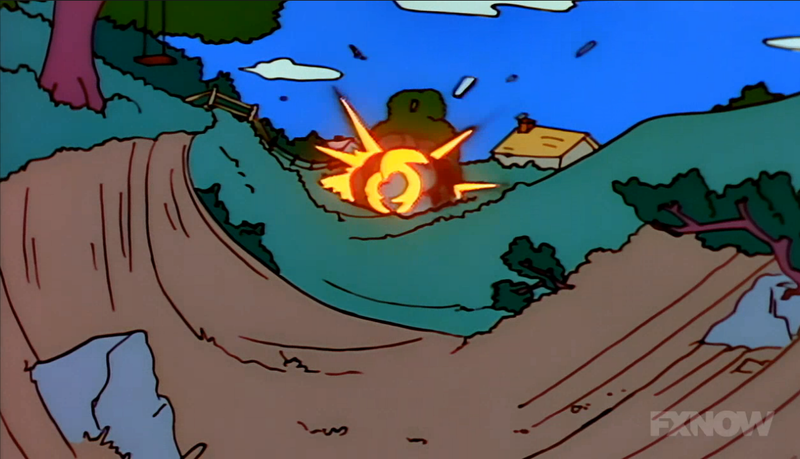 Of course Wiggum soon finds joy in his plight as he rolls through the field laughing, however it is soon cut short when he hits a tree and somehow explodes. 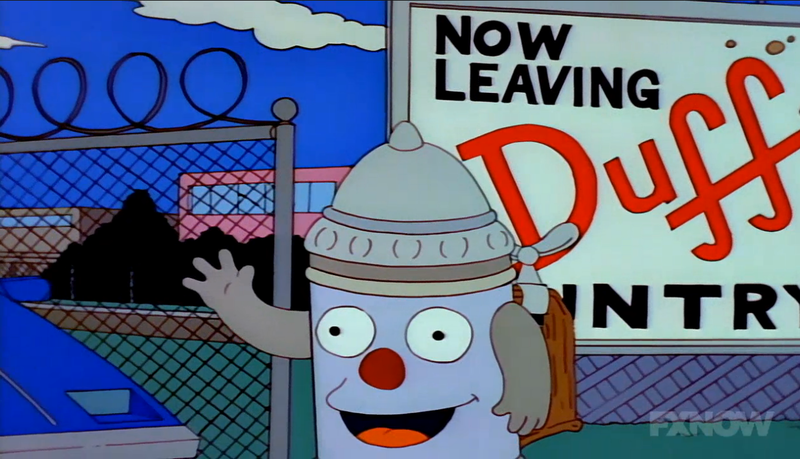 And with that we conclude the episode appearance of Beer Stein Wiggum. 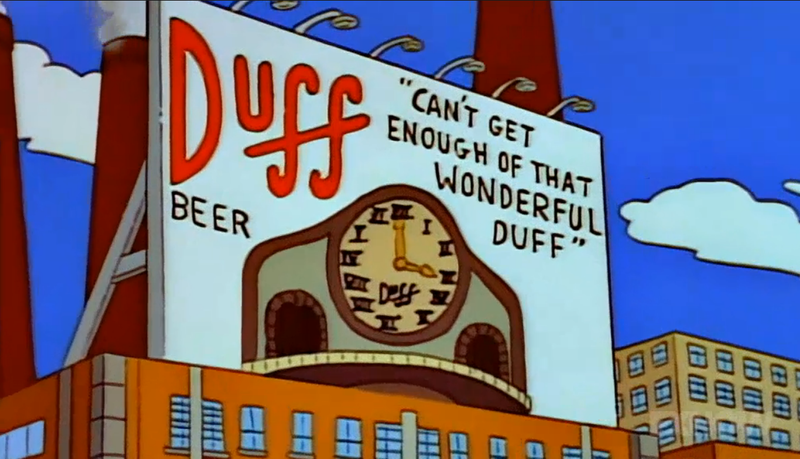 As is usually the case, a mere few minute or sometimes seconds is more than enough air time to make an inclusion to Tapped Out. I really hate to sound like a broken record when it comes to finishing up my Premium Guide’s with my opinion and having that opinion more often than not be “Go for it!”, but, a deal such as this is extremely hard to not encourage everyone to buy. For 70 donuts (with a 25 donut rebate) you essentially get to own a Chief Wiggum that pays a normal payout and with the flick of a finger you get an entirely separate Chief Wiggum that pays out a premium payout. Not to mention that the Beer Stein costume is hilarious and is rooted from one of the best episodes of The Simpsons ever made. Even this far into the game the developers have managed to find hugely iconic content one after another that, for myself more than not, make you say “Oh yeah! I forgot about that!” And then you run and track down the episode from which this great content comes from and watch it all over again. I’m not even going to list Pro’s and Con’s because, for the life of me, I cannot find enough Con’s to list. One that does stand out, but is fairly standard and common at this stage in the game, is the low number of visual tasks. But that’s even understandable as the buildings need to be utilized as much as possible to mimic a real functioning town (not even you takes care of everything in life outside for all to see). You get a great skin for the blundering Police Chief, 6 permanent tasks, although played once you get to literally experience a continuation of the epic original story that the costume was inspired from and to top it off you get two visible animations pulled straight from the episode itself. You can’t lose, plus you’ll be helping ol’ Gil possibly get a bite to eat by buying the skin. Win.Win. However you decide you’ll need to be certain and fast as this will not be offered much longer. Hope this helps. Thanks for reading. Thanks for this Mike – I find the SIB posts really useful. Had splurged some of my precious donuts on the sidewalk fountain – mainly for the bonus. Wasn’t thinking of Wiggum’s Beer stein until l read this. May have a rethink – sounds like a good buy. Next EA teaser: Halloween is coming – Get ready for Treehouse of Horror XXVI!